Curculigo rhizome (Xianmao)-Curculigo orchioides Gaertn. Part Used & Method for Pharmaceutical Preparations: The rhizomes are dug in early spring. After the fibrous roots have been removed, the roots are dried in the sun and cut into slices. 1. Weakness of kidney yang manifested as impotence, frigidity and cold pain in the lower back and knees due to obstruction by invasion of wind-cold dampness. 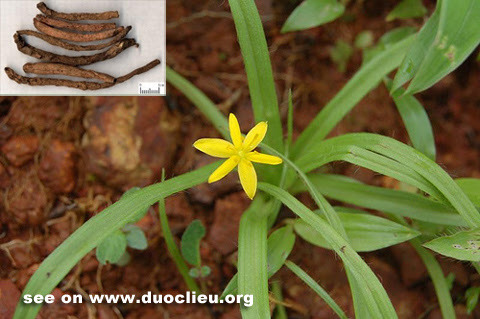 Curculigo rhizome (Xianmao) is used with Epimedium (Yinyanghuo). Cautions & Contraindications: This herb is contraindicated in cases with deficient yin and excessive fire.